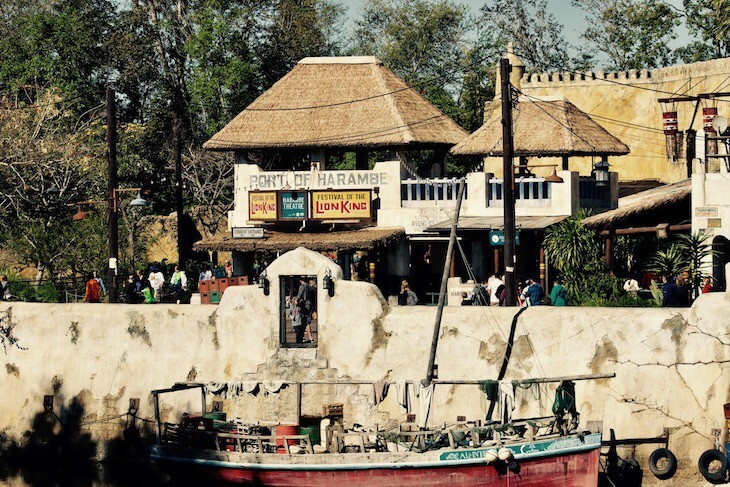 Disney outdid themselves in their creation of this modern-day East African coastal village. 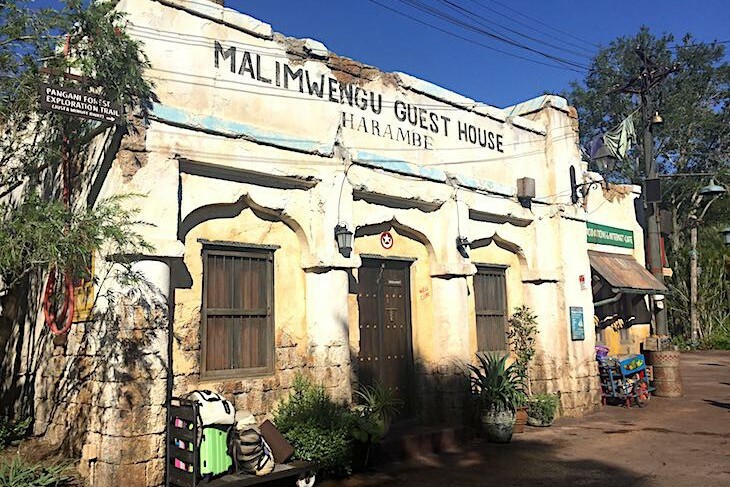 A massive baobab tree looms over the town of Harambe where the sound of drums are heard amid peeling, whitewashed buildings and dusty streets. Thatched-roofed huts and reed fences only add to the authenticity. 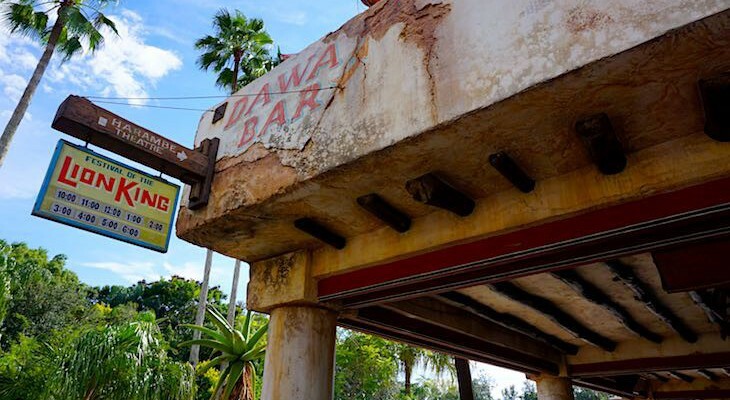 Don’t neglect to take the pathway through the village to the hop-on point for the oh-so favorite attraction at Disney’s Animal Kingdom® Theme Park, Kilimanjaro Safaris® Expedition. Board a safari vehicle to view this 100-acre savanna brimming with wildlife. The all-important message of the continuing “circle of life” is wonderfully portrayed in this sensational stage extravaganza of Broadway-caliber song and dance. 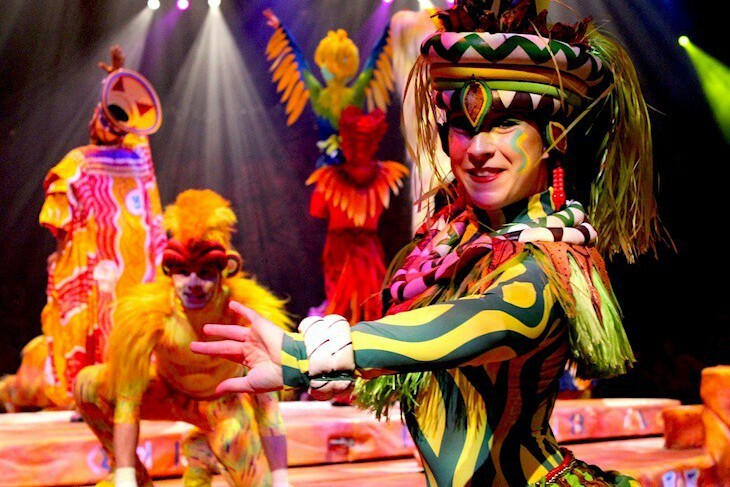 The story of the Lion King is told through a combination of elaborate costumes, wild acrobatic tumble monkeys, daring fire-twirlers, and massive Audio-Animatronics animal floats accompanied by the beat of tribal drums and jungle noise. Don’t worry, if you’re not acquainted with the music; you’ll be an expert by the time you leave. Check your guide map for showtimes. 30-minute show. 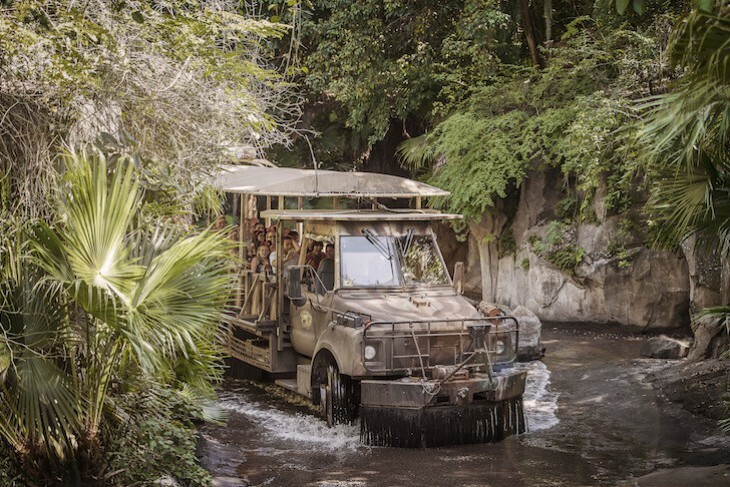 Load into safari vehicles for your trip around Disney’s 110-acre African savanna brimming with baobab trees, waterfalls, rivers, watering holes, and rickety bridges. Each excursion is different and depends entirely upon which animals decide to make an appearance. As you rumble across the authentic-looking landscape, your driver will assist in locating the wide assortment of wildlife including lions, cheetahs, warthogs, elephants, gazelles, crocodiles, wildebeests, exotic birds, giraffes, even white rhinos. Those with luck might encounter a male lion, rare because they sleep about eighteen hours a day. Some animals may come close to your vehicle, while predators and more perilous species only look as if they could leap from behind their seemingly invisible barriers. 20-minute ride. Expectant mothers and those with heart, back, or neck problems may want to sit out this bumpy ride. Cara's Tip: Don’t run for cover during an afternoon thundershower; it’s the animal’s favorite time to come out for a rain bath. Many people walk right past this self-guided trail and only when it’s too late find out what they’ve missed. Your first encounter is with colobus monkeys at the Endangered Animal Rehabilitation Center and naked mole rats at the Research Center. Then on to an aviary teeming with birds native to Africa in the midst of a cooling waterfall and an aquarium overflowing with kaleidoscopic fish. 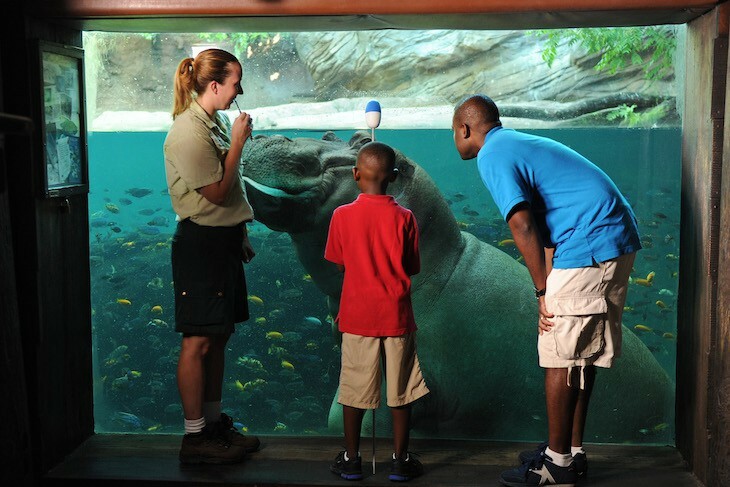 Soon all visitors are drawn to a terrific underwater observation tank of swimming hippos before hitting the real highlight—lowland gorillas. 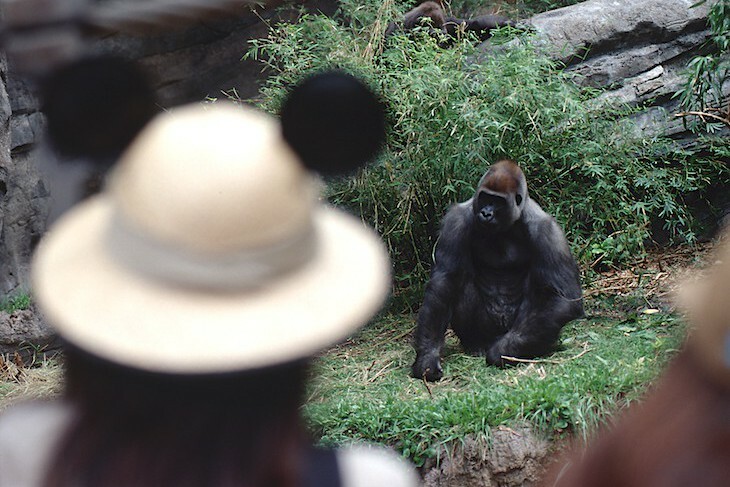 You’ll find a family of gorillas on the right side of the pathway and a group of bachelors on the other side. Take time to search for them; it can sometimes be difficult to spot them in the profuse vegetation. Experts are scattered throughout to answer questions and give short, informative talks about each exhibit. 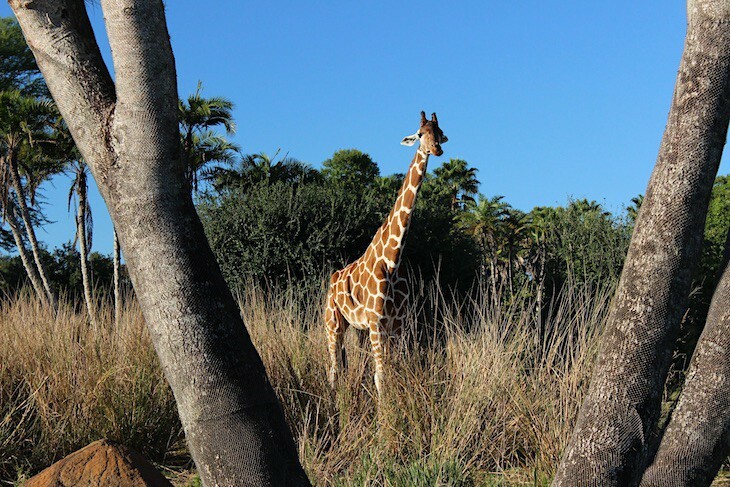 Cara's Tip: Go early after the safari or late in the afternoon when crowds are low. It can be difficult to spot wildlife from behind rows of human heads.